Truth #10 - You have a purpose. "For we are God’s handiwork, created in Christ Jesus to do good works, which God prepared in advance for us to do." There are "good works" prepared for you to do! God has gifted you, given you talents and abilities, and strategically placed you where you are for a reason! And as a believer, you know that you are not alone in your work. You have the indwelling power of the Holy Spirit to help you and to guide you. Isn't that awesome?!! If you're having trouble seeing through the messiness of life, if you don't feel like you have found those "works" for you to do......ask Him. He doesn't want to hide anything from you! Remember, He has been preparing you since the time you were in your mother's womb! 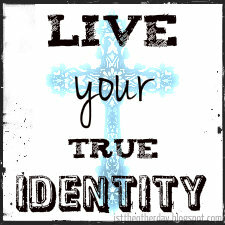 When the doubts come...and I know they will...use all that you have learned about your identity in Christ. Cling to the Word and stand on it with authority. That's part of the reason it was given to you. It's yours to use when the enemy's lies entice you to believe you don't matter! You were created with purpose.